Everyone who knows me knows that I am a bargain-hunter. Sure, I can crush my wallet in a single visit to the craft store, but most of my journaling supplies come from the Dollar Tree or the clearance bin at the drugstore. I just pick up any little, pretty, crazy-cheap things that catch my attention and toss them in a scrap bin at home to use when journaling. Lately, I've been coming across these adorable journals on sale. This pack I found had 2 for a $1. So, I could have technically called this post, "How to Make a 50-Cent Tarot Journal." Ha! But most of these little journals are $1-2 at the craft store. They each have ~30 sheets of paper, so ~60 pages if you count the front and back of each sheet. OK, time to put my $1 to work! 1. What's This Journal For? Maybe you only want to write on every third page and fill the other pages with doodles, stickers, clippings from magazines/newspapers. 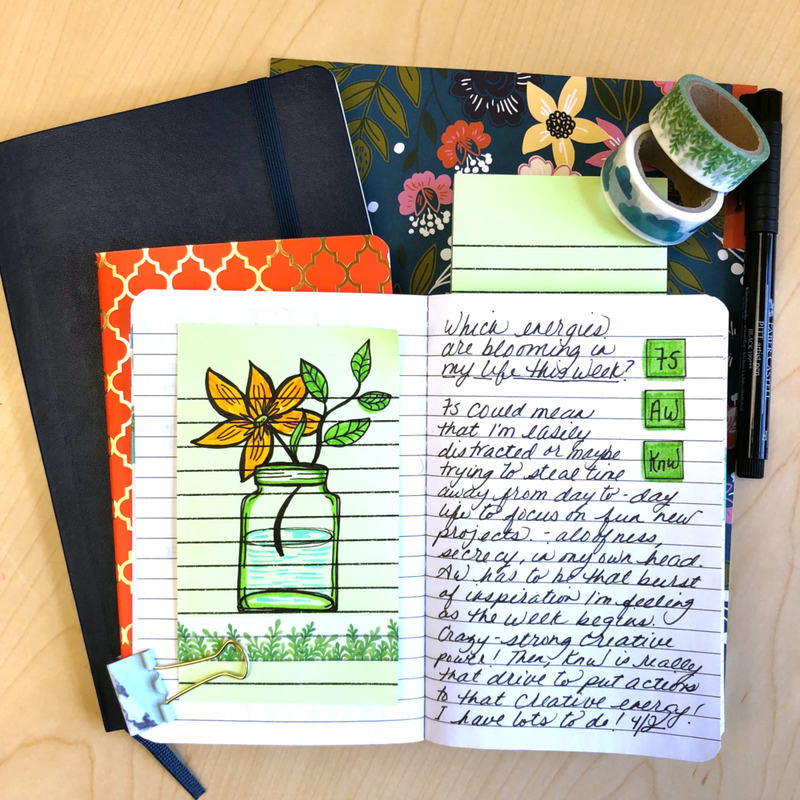 If your notebook has about 30 sheets, you could use it as a daily-draw monthly journal, writing on the front of each sheet every day for the month. There are no rules for creating this type of journal -- write, doodle, paste, scribble, etc.! Any thought, song lyric, quote, or recipe that crosses your mind, write it in. Log your Tarot readings interspersed throughout the pages. For this journal, all I used was my image collection, pens/markers, a glue stick, and my 50¢ notebook! Test your pens first to make sure they won't bleed too much through your notebook's paper, but usually you'll have good luck with Crayola markers and highlighters, if you want to add some color to your journal. OK, so this may be my favorite step, but it definitely is NOT required! If you want to find some fun imagery to paste into your journal, start with your recycle bin! You can find magazine/newspaper/mail clippings with fun words. I also like using patterned paper or washi tape to put on the edges of pages that I need to find quickly. Print images from sites like FreePik.com to give your journal some flair. +++Fun tip: If you're creating more of a self-exploration journal, do Tarot readings based on the images/words/phrases you find. If you cut out the word, "people" you could use that as a heading on a page to do a reading about the people in your life! An image of flowers? Ask, "Which energies are 'blooming' in my life this week?" If you want to add images in your Tarot journal but don't want to build an image collection or pay a fortune for stickers, I'm here to tell you that you CAN doodle your own images! Pinterest has great doodle images and tutorials. Just search, "doodle tutorial." The Willows East Pinterest page has a doodle board filled with fun doodles to try. You can doodle with pencil and eraser and go over in ink only after you feel your doodle is just right. Simple Zentangle patterns are easy to create, too, and make your pages pop! Now, all you have to do is start logging your Tarot readings and pasting some images into your $1 journal! You can draw highlighted boxes to write in your Tarot shorthand. What I love most about this journal is that you really can put together a beautiful little booklet in a short period of time. You may want to consider taking one along on a weekend road trip or declaring a quiet weekend at home your "Spiritual Exploration Weekend" and filling up your little journal with your thoughts, quotes, and readings. 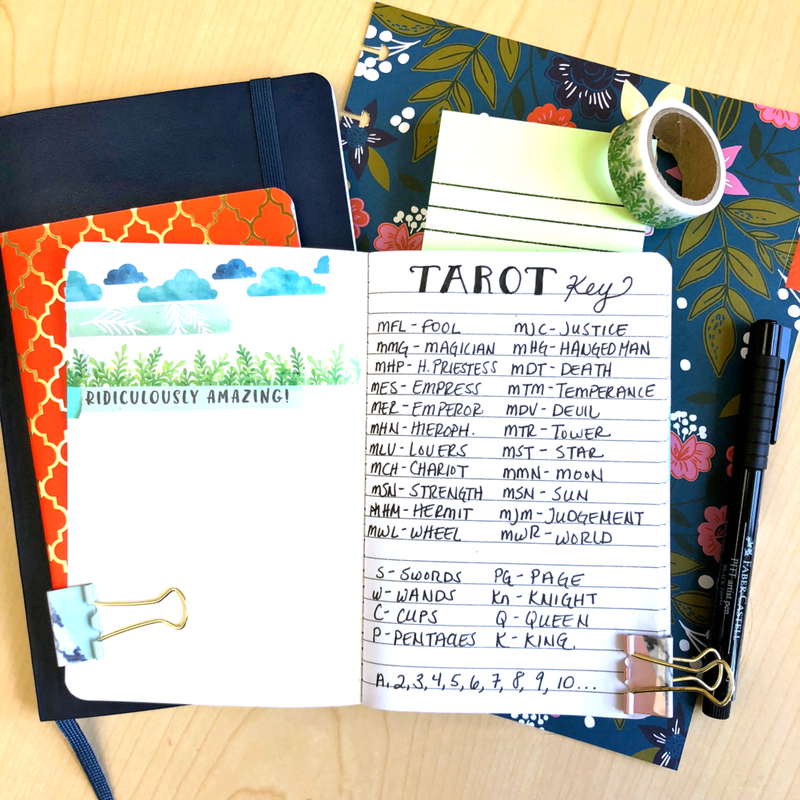 If you liked this, you might also like our post: 5 Inexpensive Ways to Turn Any Planner Into a Tarot Planner.